In a small bowl, whisk together the oil, vinegar, peach or apricot nectar, salt, and pepper. Set aside. 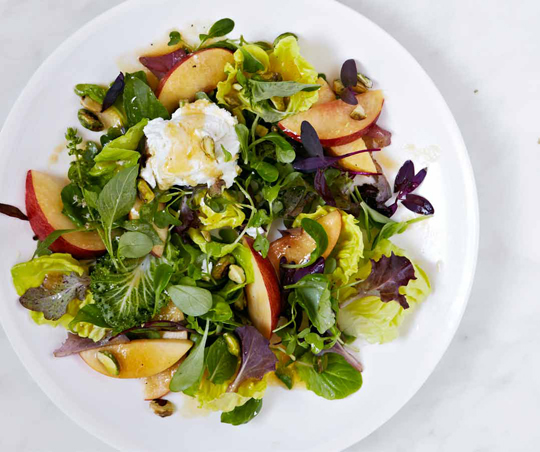 Onto each of 4 salad plates, place 1½ cups of the greens, 3 nectarine slices, 2 tablespoons of the ricotta, and 1 tablespoon of the basil leaves. Drizzle each salad with 1¼ tablespoons of the vinaigrette, sprinkle with 1 tablespoon of pistachios, and serve. NOTE: The type of ricotta cheese that is sold in the dairy section of your grocery store will work for this recipe, but I recommend you look for fresh ricotta at the cheese counter or at your farmer’s market. Fresh ricotta is creamier and has a richer flavor than commercially produced cheese.